A native of Austria, Chef de Cuisine Markus Glocker oversees the menus at Gordon Ramsay at The London. Glocker enrolled in the culinary school in Linz and, upon graduating, trained as a commis chef at the Restaurant Vier Jahreszeiten in Munich, Germany. In 2001, he began working with Gordon Ramsay at Gordon Ramsay at Claridge’s in London. He then joined the three Michelin-starred restaurant Eckart Witzigmann in Berlin, Germany before moving to the United States in 2003 to work in the kitchen of Charlie Trotter’s in Chicago for two years. In 2005, he moved back to Austria to work at the two Michelin-starred restaurant Steirereck Vienna. Glocker returned to the U.S. in 2006 to serve as sous chef of Gordon Ramsay at The London in New York, before assuming his current position. Prior to assuming his current post, Sean Scottini began his professional career in Europe working with The Savoy Group. He held the position of General Manager for MEGU restaurant (2005 to 2010) as well as Head of Restaurant Management for The Rainbow Room by CIPRIANI (1999 to 2003). He recently earned an Award of Excellence from Wine Spectator magazine. Situated just steps from Fifth Avenue shopping, Broadway theaters, Carnegie Hall, and Central Park, The London NYC (www.thelondonnyc.com) offers rare and exquisite views of the city skyline. The property boasts a variety of elegant suites that range in proportion and appointment, from the London Suites offering a minimum of 500 square feet to the stunning 2,500-square-foot duplex London Penthouse. The London NYC fuses unobtrusive service, sophisticated style, and livable comfort with interiors by renowned designer David Collins. All dining, from restaurant to room, is created by the culinary team of Michelin-starred chef Gordon Ramsay. The London NYC is the sister property to its glamorous LA counterpart, The London West Hollywood. 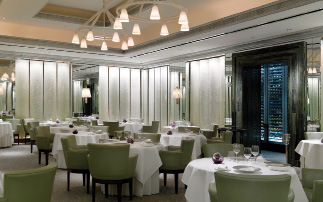 Gordon Ramsay at The London offers a formal dining experience in the evenings, Tuesday through Saturday. MAZE by Gordon Ramsay offers breakfast, lunch, and dinner daily as well as weekend brunch on Saturdays and Sundays. The London Bar offers traditional afternoon tea, smart cocktails, and small bites seven days a week. What food and beverage products do you offer at The London NYC? Glocker: We offer casual yet sophisticated dining in MAZE, where we draw upon French influences and adapt them to the modern world in which we live. In our fine dining restaurant, Gordon Ramsay at The London, we execute more formal and traditional French techniques. We do use a couple of modern techniques, as well as a little Asian influence, which is where the cuisine is going right now, both here and within the room service and private events areas. So there is something for everybody. Glocker: I don’t believe in completely changing a menu in one shot because maintaining consistent quality is paramount – but it can also be challenging. If we’re going to change a dish, let’s say every week or two, and implement this on the menu, it’s very easy for the chefs to execute as we do not lose the attention to detail. I also try to go forward with the season in mind. The idea is to ensure quality, consistency, and seasonality. Many hoteliers talk about how challenging food and beverage is. When this opportunity came about, what excited you about it, and how do you define your role? Scottini: I’ve always worked in a fine dining environment and with high-end restaurant brands, so I am now able to experience a newfound side of Manhattan, which is completely different than downtown, both in its clientele and how things work. What got me here was the brand name Gordon Ramsay and the quality of the product. Of course, I tasted the product before accepting the offer. The atmosphere is great, and what I noticed before I was hired was the great mix of clientele they have, particularly at the bar with the aperitif. When you have a great aperitif from 5:30 to 7:30 PM like we do, it creates an energy that translates directly into the dining room. Is it hard to balance a fine-dining experience, while also producing a more casual feel with room service? Glocker: It’s very difficult. We initially did the room service the same way as the fine-dining restaurant, but quickly realized that people don’t want foie gras at 3 AM; they want to have a nice salad. So we have the chefs who are doing the foie gras doing the burger as well – therefore the standard of the burger is automatically elevated. That’s how the quality of room service continuously improves and the quality of MAZE continues to become enhanced. How much of a focus is it for you to continue to create that buzz and to be that place people enjoy coming to? Scottini: It is a significant focus. People come here for cocktails and they end up staying for the small bites menu, which is very successful. I started to offer the full dinner menu at the bar, so the energy of the bar merges into the dining room and vice versa – so they become one big buzzing restaurant altogether. How much of an impact has your relationship with Gordon had on you? Glocker: I was young and didn’t know much when he trained me – it was both unforgettable and amazing. You want to give this experience to your chefs as well, which cannot be done in the same way. But you can do it in your own personal style so that the results are consistent. What is the opportunity in this space for private events? Glocker: We have a couple of private dining rooms upstairs, where we have a kitchen as well. For the most part, we do groups of 50 to 70, but we are able to have up to 200. We use the fine-dining restaurant sometimes, and we have used the kitchen in the past for a cocktail party. We try to be innovative. Will you talk about the Chef’s Table experience? Glocker: The greatest thing for me as a chef is having somebody at the table who is watching me so I can’t make a mistake. From the moment someone walks into the kitchen and sits down, the whole service is in the kitchen. People know there is no joking around or laughing, but you have to make sure the customers are satisfied. I cook something, and the second after we serve it, I look at their faces to see if they like it. It’s a very good way to get feedback, and it’s entertaining for everybody. What are your key priorities to ensure that business continues to grow? Scottini: Breakfast and weekend brunch in MAZE are doing great at this point, as well as dinner. My focus is on MAZE during the week – ensuring we come up with ideas to share and promote what a tremendous experience it is, especially in the earlier part of the evening, because it is busy after 7 PM. We have been fortunate that the business continues to remain solid.